Time for big tanks! It’s time to paint one of the three models from the Heer46 E-100 range. This is my new proyect, an E-100 Jagdpanzer Krokodil from Heer46. As we saw in angusin’s review of the E-100 Krupp, Heer46 has a range of products based on paperpanzers, tanks that only exists as schematics and blueprints. The first step was to clean it up and prepare it for the primer. 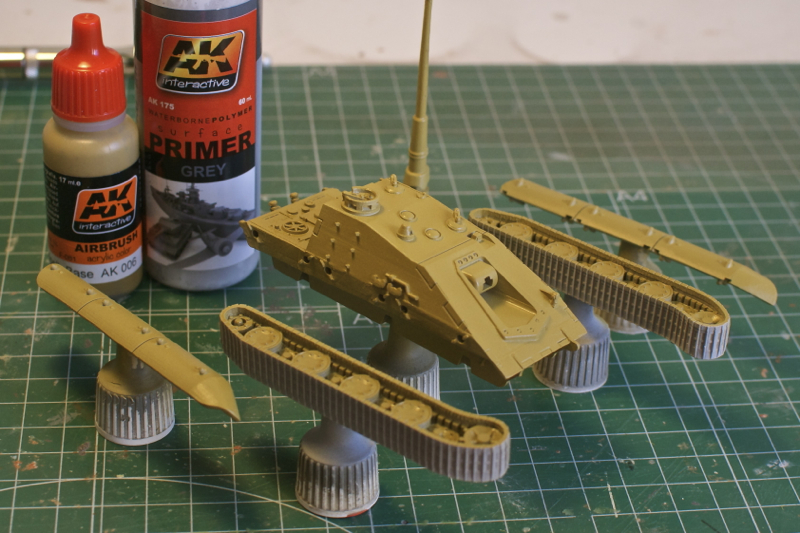 Then, logically, the primer: It was done with the AK Interactive grey primer. The idea is to use a dunkelgelb base to create one of the many types of camouflage that we can find in the late period of World War II. So I use the dunkelgelb base from the AK Interactive range (AK 006). At this point I’m ready to start the color modulation on the dunkel. See you in the next WIP!